On June 26, 1947 an application was filed with the Federal Communications Commission for approval to construct a AM Radio Station to serve the Dubois County area. Those filing for the construction permit were Gilbert E. Metzger, a dentist from Jasper, Indiana, John R. Ax, an attorney from Huntingburg, Indiana and Louis O. Mitzlaff, a doctor from Louisville, Ky. The Corporation is to be known as Jasper On The Air, Inc.
On January 8, 1948, Jasper On The Air, Inc. was granted an application for a construction permit for a new daytime only standard broadcast station to be located mid-way between the cities of Jasper and Huntingburg, Indiana, to be operated on 990 AM with 1 kilowatt power, daytime, subject to selection of a transmitter site and antenna which meet the approval of the commission. Following receipt of the authorization from the Federal Communication Commission, 51.9 acres of land located 0.2 miles south of the Patoka River bridge and 3 miles south of Jasper, Indiana was purchased from John and Bertha Vogler. Shortly thereafter a building agreement was reached with the Messmer Lumber Company of Jasper to build a 37 by 60 foot building which is to be the studio and transmitter site of a new radio station to be known as W.I.T.Z. In addition John J. Hoke Company is to furnish a 300 foot radio tower at the building site. At exactly 6:00 am on July 4th, 1948 W.I.T.Z. began its first broadcast day. At exactly 6:00 am on July 4th, 1948 W.I.T.Z. began its first broadcast day. Dale S. Phares was the first General Manager. On that historic first broadcast day area residents could listen to programs like "Harry and his Gang", "Mountain Jamboree", "Juke Box Review" and of course "Inspiration Time". Over the years Jasper On the Air, Inc. has continued to improve its service to the area. On November 1, 1954 W.I.T.Z.-FM began its first broadcast day at 104.7 on the FM radio dial with 3500 watts of power. This addition provided the first night time radio to the area and thus began the first live coverage of area high school sporting events. In 1972 a major renovation project was undertaken consisting of an increase in FM power from 3500 watts to 50,000 watts and also increasing its tower from 300 feet to 468 feet. In 1979 the original building was more than doubled in size to provide for the additional personnel that was needed to operate a professional radio station. A New Hit Country station was added in 1997. 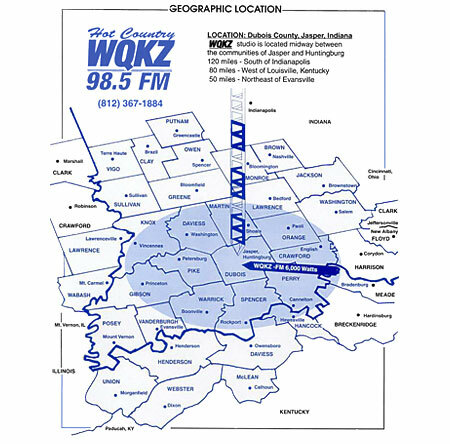 98.5FM WQKZ is a 6,000 watt FM station transmitting from St. Meinrad, Indiana. WQKZ's programming includes national recognized shows like "Ty, Kelly & Chuck", "NASH Nights Live" with Shawn Parr and Alana Smith, "The Blair Garner Show" as well as local and national sporting events. In 2013, the WITZ Main Studio underwent a complete upgrade. In 2014, the original tower was dropped to make way for a brand-new tower and antenna. In February 2015, WITZ-AM reformatted into a Latino Music Station. JUAN continues to air "Regional Mexican" music, the Hispanic News Service, and local news. 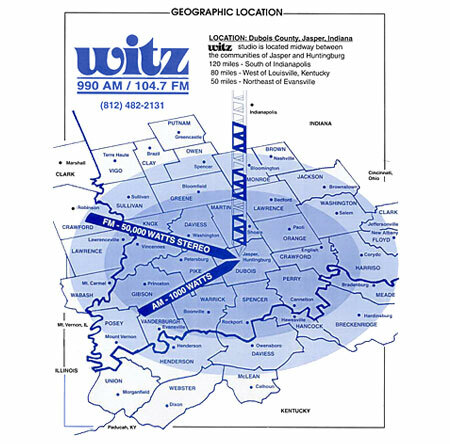 In July 2016, WITZ-AM added a 1,000 watt Translator, allowing the AM signal to rebroadcast on 99.1FM. Since that historic day on July 4th 1948 Jasper On The Air, Inc. has continued to grow with the area communities as they have grown, not only serving Dubois County, but eight surrounding counties as well.